Not all Car Wraps are equal! Vehicle wraps are becoming increasingly popular, and therefore more and more companies that have no previous vehicle wrap experience are jumping on the bandwagon. You probably notice vehicle advertising wraps almost everyday now, and they always look good from a distance (as long as it’s a nice design) but the truth is vehicle wraps are suppose to last to the manufactures specifications if installed correctly, which is usually 5 years. Some wraps fail after a few weeks. Do you really want to invest so much money into advertising that is going to look cheap in the long run ? Vital Signs QLD are experienced with vinyl wraps and have been installing for the last 7 years for many happy customers around Brisbane and Queensland. The most overlooked parts from inexperienced installers of a vehicle wrap are the preparation and post wrap steps. We always say preparation is key; if the vehicle is not cleaned from all dust and debris before the wrap process, this can have devastating effects on the vinyl product against your vehicle. Secondly if the installer is not careful during the install process your vehicle can be left with cuts and scratches under your paintwork that you will not notice until it’s time for the wrap to come off. And lastly, post wrap! There are steps when the wrap is finished to ensure that it will stay down! A lot, though not all of installers across Brisbane don’t bother with this step, even though many professional installers believe that it is the most important step! Most installers will use a product known as an edge sealer to ensure that the edges of the wrap won’t lift off. The problem here is that the primer could damage the clear coat when the wrap is removed and the residue from the primer is extremely difficult to remove. The correct process would be to make the edges are clean and post heat every inch of the edge to the manufacturer’s recommended temperature. As a last resort Vital Signs QLD use an optically clear edge sealer tape which will not damage your vehicle at all. This is one of the most common issues with car wraps. The vinyl bubbles up in recessed areas. This problem doesn’t appear during installation but rather surfaces in few days or weeks after. 1) Wrong Choice of Material: All vinyl manufacturers offer several quality levels of their products (including 3M, Avery, Arlon). If a wrong combination of vinyl and laminate is used to print the wrap on then adhesion to curved or recessed areas will be impossible. 2) Wrong Installation Techniques: Using the proper installation technique even with the right combination of vinyl and laminate is crucial in avoiding bubbles. 3) Over Stretching of the vinyl: Even the best cast vinyl can only be stretched to a certain point before loosing their posture. Over heating and over stretching in vinyl will result in bubbling. the vinyl that is placed in the recessed or excessive curved areas needs to be heated to manufacturers specifications in order the kill the memory of the vinyl. If this process is skipped there is a good chance that they vinyl will go back to its original shape and bubble up. Once the vinyl is installed, it is the Final Trimming of the vinyl that will determine if a wrap looks like a paint job or just a bad sticker. A steady hand, lots of experience and proper techniques are required to achieve a perfectly trimmed edge. Using the weather stripping of the vehicle to tuck the wrap is an easy way to ensure the there will be no lifting of the edges. However, the installer needs to make sure not to cut the actual weather stripping when trimming the wrap short enough so it would fit under the strips. Getting around curves and recessed areas is not easy. The shortcut is chop up the wrap into multiple pieces in order to cover the area. This might be necessary on certain vehicle bumper installation where it’s almost impossible toreach a quality and durable wrap without having multiple layers. Again, it’s a an art when it comes to overlapping the vinyl without creating large visible seems. Some vehicles door handles are very difficult to remove without having to remove the entire door panel. However, there are several techniques that ensure the vinyl is not over stretched and installed properly for long-term durability and good looks. To make a car wrap look good the installer needs to make sure that the edges are squeegeed flat and there are no wrinkles. What does all mean to you as a customer? At the end of the day you will get what you pay for. A rushed wrap installation is almost guaranteed to fail in the future Bubbling and lifting will result in the vinyl to dry and crack which will further result in moisture to get under the wrap and cause failure in major sections. Vital Signs QLD take all precautions and ensure that we install our wraps correctly, even if they take longer we would prefer to have the wrap leave us with no issues and customer satisfaction, then hope our customers don’t complain about a poor quality wrap! Ways we avoid failure with our vehicle wraps! Preparation is key! we always ensure we are working with a clean surface, your vehicle is cleaned from top to bottom so it is not dirty when we install your squeaky clean new wrap. We only use the proper tools so that we can avoid scratches on your wrap and cutting into your vehicle. There are many inferior cheap products on the market today coming in from all over the world. Vital Signs QLD only use proven vinyls manufactured to use within QLD conditions. We use these products so we know it works. The first 3 steps are only the beginning, you also have to know how to install the graphics for different types of vehicles, taking into account different situations every vehicle can pose. Probably the most important step, Post Heating! After the wrap has been installed every section of the vehicle that has the wrap applied must be heated with a heat gun to reset the vinyl films memory so it stays where it is suppose to. If these steps are taken, (which we always do!) then you should be sure to have a vehicle wrap that will be vibrant and durable for many years to come. You can look at some wraps we have completed over on our Wraps page if you are interested in contact Vital Signs QLD for your next project. A while ago Vital Signs QLD were contacted by a potential customer about a food trailer wrap. We were excited because we love food and we love wraps! 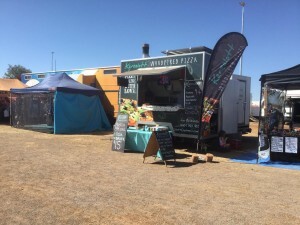 Our customers were named Karealott Woodfired Pizza and you guessed it, they had a wood fired pizza trailer that they wanted to brand and create a unique identity with vinyl wrapping and other signage. Our crew at Vital Signs QLD were delighted that our quote had been accepted as we love creating unique out of the box branding wraps for our customers; So the design process began. We had submitted two different design choices to begin with, one was a timber look with a love heart pizza shaped logo, and one was more simplified to look like a blackboard, to symbolise the hand made love that goes into the pizza our customers are creating. We printed the graphics onto Arlon 6000XRP vinyl with gloss laminate, a vinyl used for complex car wraps. Printed on our Roland XC540 Eco Solvent printer for awesome colour! The wrap was installed over two days at our site and our customers loved it! Vital Signs QLD have spent this week wrapping not one but two vans for the nationwide company Jetpets! This was a fun job as we had digitally printed onto Avery vinyl wrap media with a dark blue to light blue blend.. fading into white to blend back into the existing colour of the vehicle, by finishing the vinyl on the contour of the vehicle we can create a seamless look! The vehicles were completed with vinyl cut graphics layered over the top of the digitally printed vinyl and one way vision on the rear window. Jetpets were more than happy with the finished product and we had a good timing getting it done!